The baby of the Terrain Aeration fleet. This machine allows us to reach the places that others cannot reach. Weighing in at just eighty kilos and measuring sixty centimetres wide, the Remote can pass through most, if not all, garden gates and can also be lifted up garden steps and terracing in most gardens. We have effectively added a standard yet compact Airforce Terralift® machine to a sack truck which allows the operator to wheel the aerator into the tiniest of spaces where our other Airforce machines could not operate. 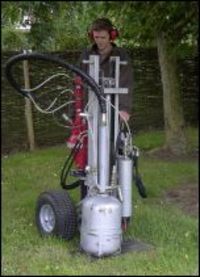 Launched at the Institute of Groundsmanship Saltex show in 2008 the Remote machine was built to deliver a specific service to fulfil demand for aeration in remote places.